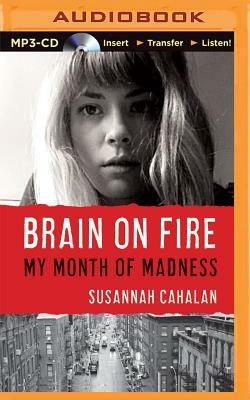 One day, Susannah Cahalan woke up in a strange hospital room, strapped to her bed, under guard, and unable to move or speak. Her medical records--from a month-long hospital stay of which she had no memory--showed psychosis, violence, and dangerous instability. Yet, only weeks earlier she had been a healthy, ambitious twenty-four-year-old, six months into her first serious relationship and a sparkling career as a cub reporter. Susannah's astonishing memoir chronicles the swift path of her illness and the lucky, last-minute intervention led by one of the few doctors capable of saving her life. As weeks ticked by and Susannah moved inexplicably from violence to catatonia, $1 million worth of blood tests and brain scans revealed nothing. The exhausted doctors were ready to commit her to the psychiatric ward, in effect condemning her to a lifetime of institutions, or death, until Dr. Souhel Najjar--nicknamed Dr. House--joined her team. He asked Susannah to draw one simple sketch, which became key to diagnosing her with a newly discovered autoimmune disease in which her body was attacking her brain, an illness now thought to be the cause of "demonic possessions" throughout history.